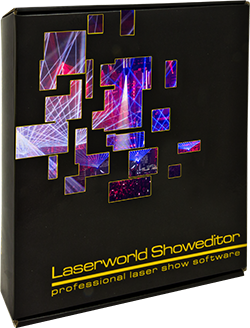 Laserworld Showeditor is a professional laser show control software that provides timeline programming as well as live laser show control features. Showeditor can handle files compatible to the ILDA standard and comes standards with a Network / LAN interface, which allows for easy laser control even over long cable distances (CAT 5). Laserworld Showeditor offers a variety of interfaces to and from external devices, like MIDI, DMX or LAN. It is possible to create spectacular laser shows synchronous to audio files or even videos, and output the signal to up to 16 physical hardware interfaces (DACs) - allowing for matching these to 16 program channels with 3 tracks each. So even large scale shows can be created with and controlled by Laserworld Showeditor. For professional applications it is possible to remote-control the software via MIDI or DMX. This is possible for timeline programming and playback as well as for live laser show control. The ShowNET LAN interface, that comes standard with the Laserworld Showeditor Set, works very stable through the standard TCP/IP transmission protocol. It converts the digital LAN signal to the standard analogue ILDA signal, which is compatible to the utmost computer controllable laser systems in the market. The control signal can be distributed with using a normal, standard network switch, so several ShowNET interfaces can easily be connected.